This striking design was made to provide a place to display a few nice bottles of wine and wine glasses for people who don't have the space or can't afford a wine cellar. The tapered legs create a nice balance with this design. The inlayed cherry butterfly keys make a true reflection of the Art's & Crafts style. The cabinet is assembled with mortise and tenon joints and solid bronze hardware. 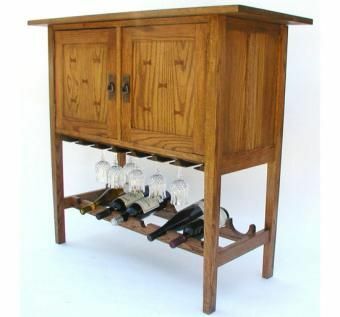 Every Cabinet comes with 6 wine glasses and a complimentary bottle of wine. Dimensions: Size: 37 Â¾" high 17" deep and 42" wide.